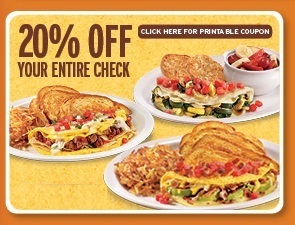 Denny’s Coupon! Save 20% Off of Your Entire Check! Denny’s is offering this coupon for 20% off your entire check, good October 26, 2014. Discount is good on your entire food purchase, alcoholic beverages not included. You must print and present coupon to receive 20% off your entire check. One coupon, per check, per visit. Not valid with any other coupons, promotional offers, or AARP 15% off entire check discount. This offer can only be redeemed once by the original recipient. Taxes and gratuity not included. Alcoholic beverages not included. Valid at participating restaurants only. No substitutions. Dine-in only. FREE Coffee at Denny’s On Valentine’s Day! Denny’s wants to help you celebrate Valentine’s Day by offering free coffee for all of its customers. No purchase is necessary. Offer valid from 6 am to 2 pm on February 14, 2013. More details are posted on Denny’s Facebook page. If you can’t make it on Valentine’s Day, Denny’s is also offering this coupon valid through February 24th for a free coffee with any entree purchase.